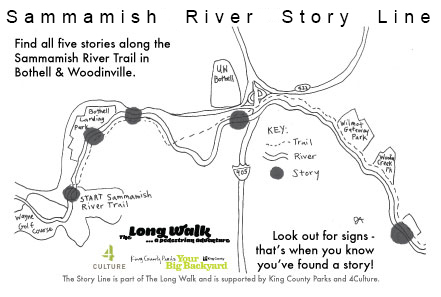 For The Long Walk 2012, Jenny Asarnow (audio artist, radio show producer for KUOW, and Long Walker from 2011) created Sammamish River Story Line, a series of audio stories/confessionals of people living and working near the Sammamish River Trail. Through the project, Jenny has de-centralized the Regional Trails System and created a secret squirrel portal that allows listeners to jump back and forth through past, present, and future. Call 425-458-4431 from wherever you are and eavesdrop on vivid descriptions of the lives, secrets, and challenges of real, live folks. And, if you happen to live near the Sammamish River Trail, I invite you to take a walk and visit her series of charmingly illustrated signs. Plus, you can add your own story in response, bringing multiform participants and their voices to The Long Walk.